OMG Posters! 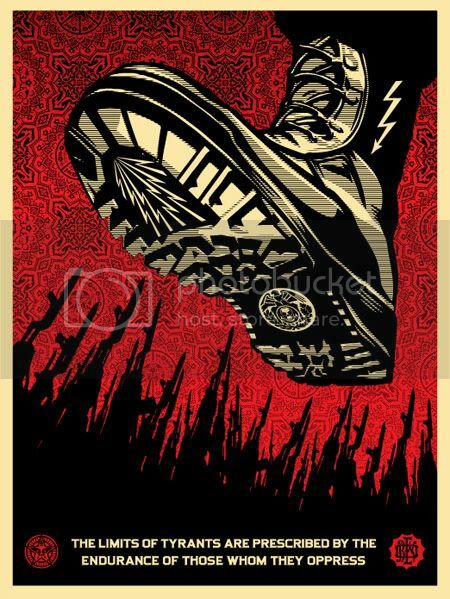 » Archive New Obey Art Print: Tyrant Boot (Onsale Info) - OMG Posters! Ah, it’s nice to see Shepard Fairey finally doing a throwback to his propaganda style of old. “Tyrant Boot” is set to release sometime today (Thursday, August 21). It will have the new Obey edition of 450 and the new Obey price of $45. Visit ObeyGiant.com. ObeyGiant.com has the price set at $45. This is dope because hes giving the proceeds to Revok, like most of us have said before, Shep has really fallen off, but this is mad cool of him. Buy this cause you respect Graffiti as an art, not to flip on ebay. DOPE DOPE..SHEP HAS NOT FALLEN OFF! FU@K THAT! This is strictly an helping hand..i give shep mad props for putting his supply and demand aside to help REVOK! what time wer these posted “indiana” time? In for 4, but Im pretty sure they will cancel 3 of my orders. I got 7 of them, can’t wait to put em up on ebay! Shep obviously doesn’t understand that he/she’ll only get one print. I knew the flippers were a bunch of opportunistic tards, but id didn’t realize they couldn’t read either.